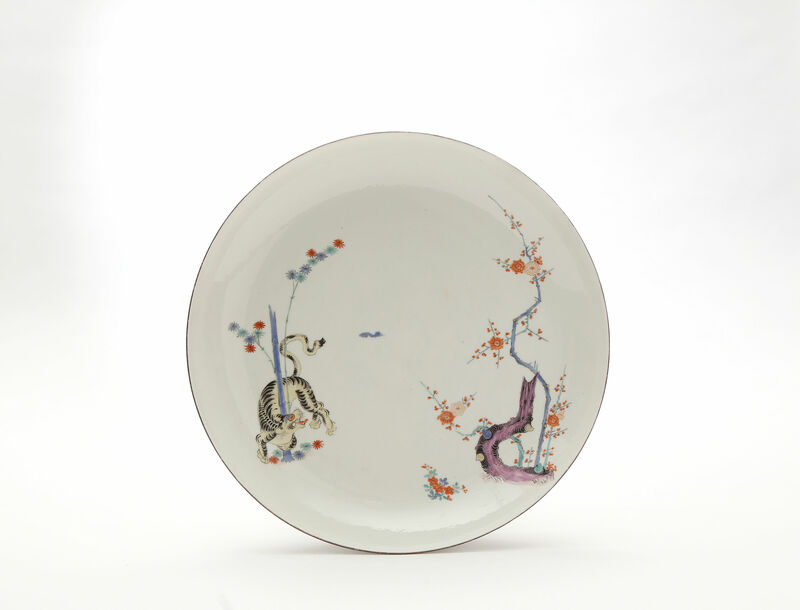 The overglaze crossed swords mark identifies this dish as one the pieces that the French merchant Rudolf Lemaire commissioned from Meissen with the intention of passing them off as genuine Japanese Kakiemon porcelain in Paris where demand had pushed prices to high levels. 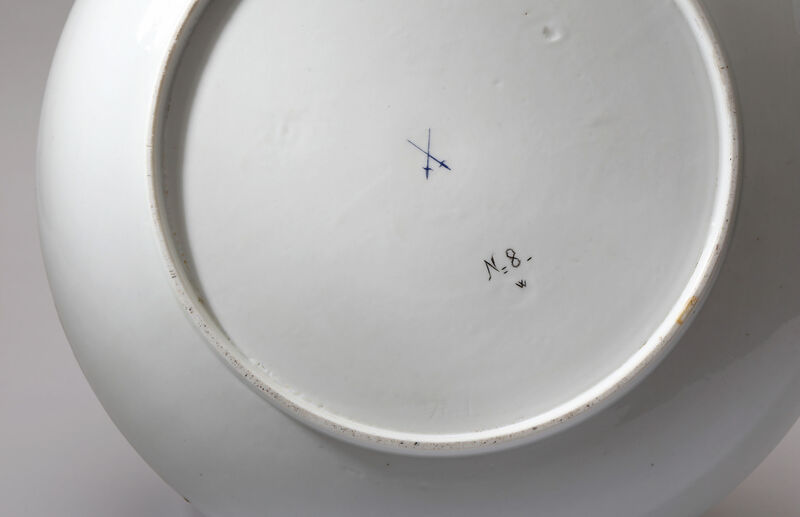 Lemaire requested that Meissen use an over glaze mark because it could be easily removed. The records of the court case of his prosecution for this fraud are recorded in great detail and subsequently about 4400 pieces were confiscated and incorporated into the Saxon Royal Collection where they had the Japanese Palace inventory mark incised into the paste by a team of glass cutters. This is one of those pieces. 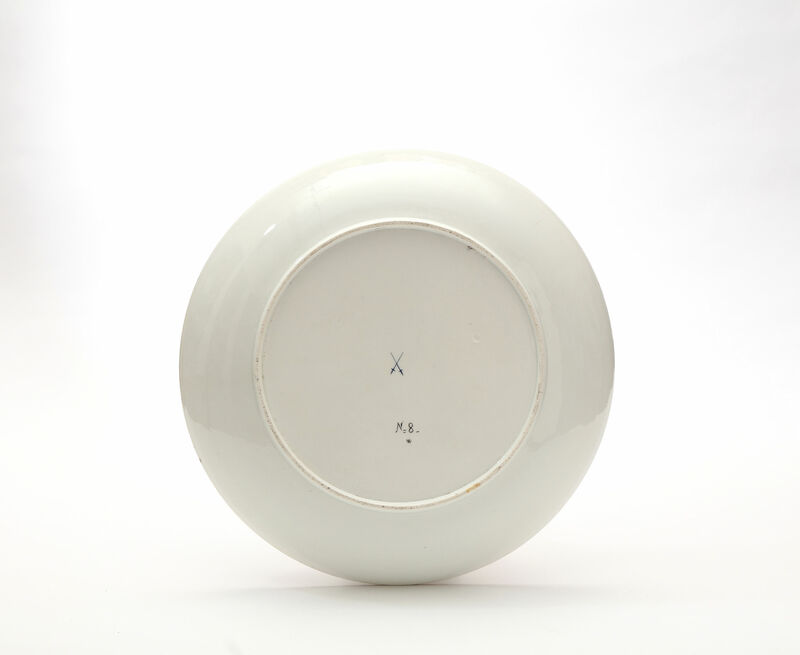 This indicates that there were 70 dishes of various sizes in the earlier inventory and 60 remaining in 1770. A further mark ‘No. 1’ is incise within the footrim under the glaze before firing. Julia Weber records another example of a smaller dish of this pattern in the Hetjens Museum, Dusseldorf, with the mark ‘No.4’ incised in the same way1. These numbers indicate the sizes (ours being the largest) and are probably the factory master models on which others were based. Augustus the Strong particularly admired these Kakiemon patterns and the final approach along the long enfilade to his throne in the Japanese Palace was decorated with what were described as ‘alten Indianischen Art’ and were part of the scheme in which he identified himself with the emperors of China and Japan who also, like him, produced porcelain. This dish would most likely have been displayed amongst them. After acquiring these pieces Augustus chose their design for the earliest large scale Royal service which was removed to the Warsaw Royal Pantry in 1734, his son, Augustus III, continued to add to the service2. The form of our dish is that of an Asian saucer dish, the later pieces ordered for the court adopted the everted rims required of European service wares. Literature – 1Julia Weber, Meißener Porzellane mit Dekoren nach ostasiatischen Vorbildern: Stiftung Ernst Schneider in Schloss Lustheim, p. 90. 2For a discussion of this service see Maria L. Santangelo, ‘A Princely Pursuit, The Malcom D. Gutter Collection of Early Meissen Porcelain, 2018, no. 69, p.199.